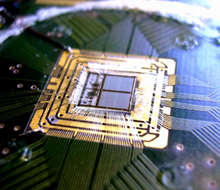 A chip brain created by the FACETS project will have 200,000 neurons and 50 million synapses. This not a software simulation of a brain; this is a chip consisting of hardware neurons and synapses. ...the brain is dramatically different from conventional computers. The differences are not only due to the use of biological tissue rather than silicon but also in terms of the computing architecture. The brain is not composed out of highly specialized and separated building blocks like a microprocessor but exhibits a rather uniform structure. It does not use Boolean operations like ANDs and ORs to perform logical operations on well defined stable states but involves the dynamics of transient states to code and to process information. Maybe most importantly, there is no engineered software to deal with pre-defined situations. Instead, the brain is based on a huge number of truly massively parallel non-linear processing elements (neurons), a very high connectivity (synapses) and self-organisation (learning, plasticity). "[so] rather than simulating neurons," says Karlheinz Meier, a physicist at Heidelberg University, in Germany, who has coordinated the Fast Analog Computing with Emergent Transient States project, or FACETS, "we are building them." Using a standard eight-inch silicon wafer, the researchers recreate the neurons and synapses as circuits of transistors and capacitors, designed to produce the same sort of electrical activity as their biological counterparts. The advantage of this hardwired approach, as opposed to a simulation, Karlheinz continues, is that it allows researchers to recreate the brain-like structure in a way that is truly parallel. Getting simulations to run in real time requires huge amounts of computing power. Plus, physical models are able to run much faster and are more scalable. 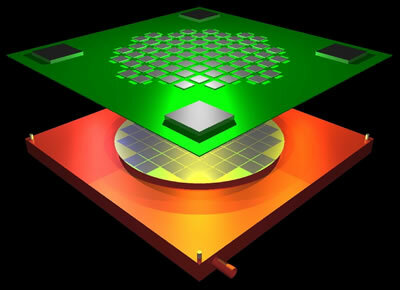 In fact, the current prototype can operate about 100,000 times faster than a real human brain. SF fans have been waiting for hardware brain components for generations. From Building a Brain on a Silicon Chip and the FACETS Project website. Thanks to muj0 for the tip and the reference.